Whenever I talk about leadership to various audiences, I use two concepts as illustrations. The first I thought was my concept of risk management, until I Googled it and discovered that others had thought of it too. It solidified in my mind at the conclusion of the theatre strategic shaping operations for the second battle of Fallujah in November 2004. The organisation I headed had achieved so much over about three months and, when on the verge of handing the fight over to the Marines, there was a natural tendency to relax. What I’d learned the hard way over a long operational career was to stay ‘paranoid’—there could always be people looking to hurt us. But the paranoia has to be constructive and so ‘Constructive Paranoia’ as a personal concept was (re-)invented—a concept which generations of soldiers know from bitter experience to be true and have expressed in many different ways. The second concept is borrowed with permission from the St James Ethics Centre where, as a director, I hang around with philosophers. Simon Longstaff gives an excellent presentation on ‘Constructive Subversion’ as a way of outflanking unthinking custom and practice, the greatest threat to effective leadership that I know. The ADF would seek to undertake operations against an adversary’s bases and forces in transit, as far from Australia as possible. This might involve using strike capabilities and the sustained projection of power by joint task forces, including amphibious operations in some circumstances. This is sensible (and about the closest that the DWP2013 gets to a coherent operational concept), telling us how the materiel that we fantasise about buying might be used. 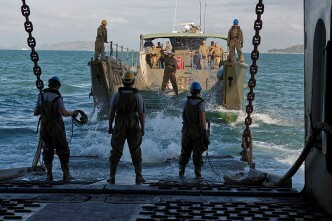 … the aim is to eventually produce an amphibious capability suitable for employment across the spectrum of operational activities—i.e. from humanitarian and disaster relief missions through to power projection operations. That’s a huge range of activities, and the upper end would require considerable support from the ADF’s most capable combat platforms…. 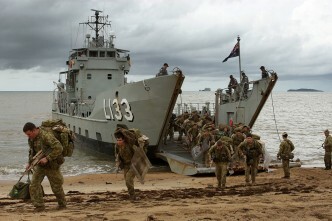 In short, most of the ADF’s capability would have to be mobilised to support opposed amphibious operations. But Andrew seems to rely too much on dubious conclusions from official strategic analysis when he says that: At most, two LHDs could land a couple of thousand Australians on a beach at the end of a vulnerable supply chain—and it’s hard to find problems that have that as the solution. … means that reality has intervened in the development of an amphibious capability. Our land forces have the capability and capacity to do many things that will add to the security of the region and help in times of dire need. But they won’t have the scale, firepower or air cover for decisive amphibious combat operations in any serious conflict. Thankfully, that seems to be off the table for now. I can’t predict the future and my experience with those who claim that they can is that they have yet to be right. But why is it that we chose to observe dubious or silly stated or implied conclusions in strategic papers when we totally disbelieve the financial forecasts in the same papers? 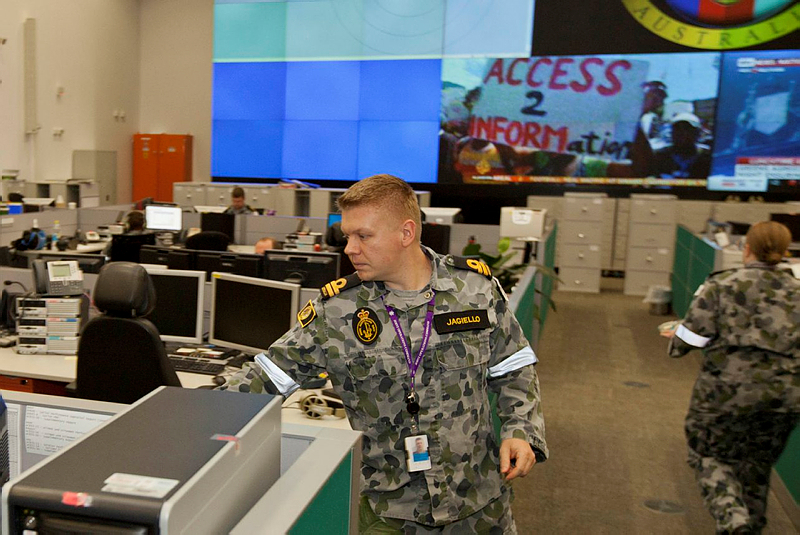 If the government was prepared to be duplicitous in the financials, why would you take their word that the future holds only regional operations for Australian military capabilities, most likely involving predominantly humanitarian assistance? Is it because such commentary assumes that Australia will have, over the life of these two ships, the luxury to accept or reject all its fights with an infinite period to prepare? This, along with the hope that Australia will always just be able to send a token force to an alliance, and that the ADF will never really have to fight jointly and seriously, represent the unthinking custom and practice of ‘minimalist’ strategic thought in Australia. My take on the strategic environment is that the ADF hasn’t faced a more uncertain future for decades. The reasons for this include the relative decline of US power; the increased likelihood of conflict approaching Australia’s shores (see Ben Schreer’s ‘The Unthinkable War‘ ), making Australia almost a front line state; and the direct and indirect dependence of Australian prosperity on energy flows from an increasingly unstable Middle East. If the neat strategic concept of Indo-Pacific is to mean anything except a 21st century version of the meaningless ‘Defence of Australia’, then honest conclusions have to be drawn and reflected in force structure, not just words. Sophisticated joint warfighting should be its reasonable stretch operational objective in uncertain times. (See an Operational Scenario here.) 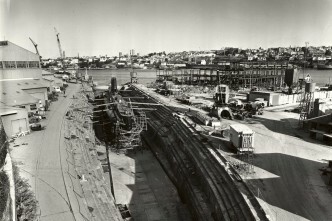 Minimalist strategists tend to ignore the concept of setting preconditions within a campaign plan for the use of amphibious capability (as distinct from using them on suicide missions), while saying that a militarily logical amphibious operation as part of a campaign will never be the answer to any strategic problem. This is short sighted in the extreme, and represented the unthinking custom and practice of minimalist strategy. And limiting the concept for their use to within 1,000 km of an Australian mainland airbase while entertaining the only alternative being a straw man STOVL capability, is hard to understand. use these ships to create around them a truly joint ADF that can actually fight and win in sophisticated joint warfighting operations. Be constructively paranoid because, as we all know, and as the Leader of the Opposition says: “s**t happens”. And constructively subvert unthinking custom and practice of the kind that gives us the school of minimalist strategic thought that is so dangerous to Australia, because it assumes that Australians cannot defend Australia. Future Governments will thank you.